The Chilean Empanadas are really really good. So it’s a good thing you’re wondering about them.For those of you who don’t know what they are, basically, it’s a stuffed bread. The name comes from the Spanish verb empanar which means to coat in bread. But really it’s not coated in bread but a rich and flaky dough. The dough is wrapped around the stuffing and the meat ones are usually shaped in a triangle. The ones made out of cheese and seafood can either be square or a semi-circle. They are eaten a lot here in Chile but they are most popular on Chile’s Independence Day celebration (the 18th of September), especially the meat ones. At this time you’ll find them everywhere. The traditional Chilean stuffing’s are usually with meat, cheese or sea food. The most common ones are the meat and cheese. There are two ways of cooking them, they either bake them or they fry them. The meat ones are called Empanadas de Pino and they have basic ingredients such as onion, black olives, raisins, hard boiled eggs, different spices such as salt and pepper, and obviously the meat that is beef. Some use ground up beef and others cut the beef into little pieces. The spices vary depending on the part of the country that is made, some put mequen to make it spicy and others use cilantro. These can be either oven baked or fried. The oven baked ones usually are much bigger than the fried ones. 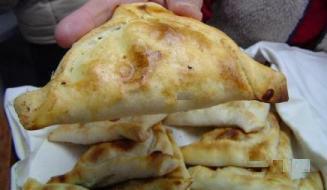 The traditional cheese empanadas, called de queso don’t have anything else besides cheese. They usually are square shaped although they also make them into a semi-circle. The most common way that they are prepared is fried, and is served at cocktails as appetizers. These are a kind of finger food. There are restaurants that serve different kinds of cheese ones, mixed with shrimp, others with cheese, tomatoes and ham and so on. Some people eat them with powdered sugar. The empanadas de mariscos (seafood) filling are also made with onion and other spices. But they don’t have black olives, raisins or hard boiled eggs like the meat ones do. The main ingredients are usually copped up mussles, locos (abalone), shrimp, myidae and other seafoods. Some of them have a mixture of seafood and others have just have one kind. They are also fried and served as appetizers. Since the meat ones are bigger than the others, they are usually served as the main course of a meal, unless you ask for a fried one then they will come in portions of 6, most of the time, just like the cheese and the seafood ones. My advice is to ask how many will you get and you’ll know how big they are. They are all very good so if you get the chance to try one here in Chile, don’t miss out on this opportunity because you won’t regret it.